Newly signed Spanish player Santi Cazorla has revealed he can't wait to get started at Arsenal after completing his £16.5million move. The 27-year-old Spain international arrives at the Emirates from Malaga as manager Arsene Wenger shakes up his squad. Cazorla is already with Arsenal at their German training camp, where he has been since Monday when his now former employers, Malaga, allowed him leave while the finer points of the deal were eked out by the two clubs. 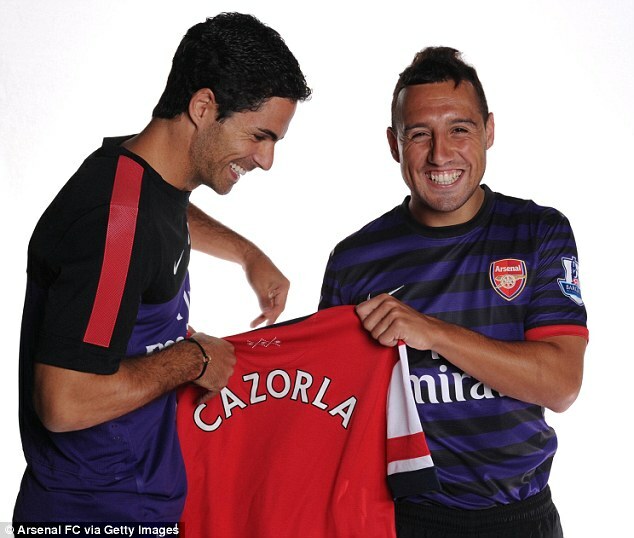 Wenger, who has already signed Lukas Podolski and Olivier Giroud, is delighted to have finally secured Cazorla. He said: 'Santi Cazorla is a great signing for us. He is a player with good experience at both club and international level, who will add significant quality to our squad. The tricky midfielder is on course to make his debut against Cologne on Saturday in a bid to slot in with his new side as quickly as possible. Cazorla said: 'I'm so happy to be joining Arsenal. This is a club with great players, a fantastic stadium and huge support. 'The club has one of the best managers in football and their style of play is recognised and admired all over the world. After making his way through the ranks at Villarreal, the 27-year-old earned his first Spanish cap in 2008, and has been part of their title-winning set-up ever since, including their most recent triumph at the European Championships in Poland and Ukraine earlier this summer. The financial turmoil that has plagued Malaga in recent weeks slowed the deal to an excrutiating pace for Wenger and Gunners fans, but in the end the Frenchman got his man. After the departure of Samir Nasri and Cesc Fabregas to Manchester City and Barcelona respectively last season, Cazorla's arrival is sure to excite the Gunners faithful, as the sure-footed attacking midfielder is comfortable on either flank, or playing through the centre. I/We intend to provide a memorable and professional Basketball cups presentation evening for our Junior Golf Academy and your services and excellent products will I am sure add distinction to the occasion !